To retain customers, you must give them the best service possible. They can get the same products from competitors, but they can’t get the same service. If you do not have a product in stock, get it for them as quickly as possible. Get to know your customers person- ally. Make a point of getting to know and remembering their names and preferences. This is not always easy in a city environment, where you have a greater variety of people visiting your shop, but it is still worthwhile making the effort. In many cases you actually want to do business with your customers’ children and grandchildren in the future. You must always be around for your customers. You can never anticipate when they will need something and therefore you should be in your shop all the time. It is easier to do if you have a partner, like Theo’s wife Helen, who joined the business soon after they got married in 1991. 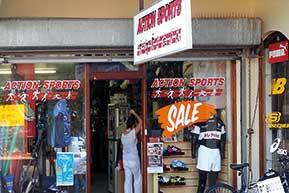 Theo Koutsoudis founded Action Sports 25 years ago and despite the tough trading conditions for independent sport stores, he has grown his business, which is still operating from the same premises in Summerstrand, Port Elizabeth. When he opened his doors in 1989, the shop was smaller, but seven years ago, when the opportunity arose, he extended the premises to its current size. It seems that the interest in the business of sports runs in the family. His brother, Lambros, bought a sports shop, The Footballer & Sports, about twelve kilometres away in Newton Park a year before he opened Action Sports. Theo and his brother were both interested and active in various sports at school. From his varsity days he chose rugby as his first love and continued playing first league rugby for the university until he was 36 years old. He represented Eastern Province at U20 and U23 level. His involvement in sports at the university, no doubt, assisted with attracting student customers to his shop. Although his father was not involved in retailing, Theo says that the talk in his parents’ house often concerned business and trading — and that is probably where he picked up his own interest in business. Because of Action Sports’ location an important sector of its market are the students of Nelson Mandela Metropolitan University, which is only about a kilometre up the road. In his student days there were only about 3 000 students, but that number has grown exponentially. Currently, there are more than 33 000 students. 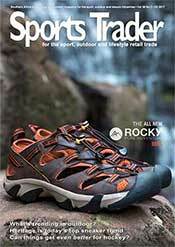 Being young and active, they frequently need sporting goods, clothing and footwear. Theo’s customer base is more mid- to upmarket, with virtually no bottom end. He sells a lot of replica and also corporate wear. Team kits are also important to him, again mainly because of the dominance of the students from the university. The biggest portion of the floor space in his shop is taken up by footwear and it makes up the biggest portion of his sales. Tourists also make up an important component of his customer base, but virtually only during the Christmas and New Year holiday season, and, to a lesser extent, the Easter holidays. Events such as the Iron Man also generate important business during certain times of the year. The more advanced athletes will then visit his shop.